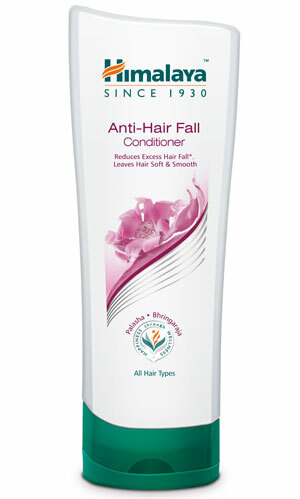 Himalaya Anti-Hair Fall Conditioner nourishes, fortifies, and improves the hair texture, making it smooth, soft, and healthy. Enriched with protein-rich herbs like Bhringaraja and Chickpea, it stimulates hair follicle growth and effectively strengthens hair strands and roots, helping control hair fall. Bhringaraja, traditionally used in Ayurveda for hair growth, is rich in phytochemicals like eclalbosaponins and wedelolactone which help promote hair growth and strengthen the hair root, helping maintain hair health. Butea Frondosa (Palasha) or 'Flame of the Forest' is native to India and Southeast Asia. It strengthens hair, helps reduce hair fall, and prevents hair thinning. Chickpea, a rich, natural source of protein, effectively nourishes hair, making it healthy and strong. Bhringaraja, Butea Frondosa (Palasha) and Chickpea. After shampooing, gently apply Himalaya Anti-Hair fall Conditioner along the length of wet hair from base to tip. Leave for two minutes. Rinse thoroughly. For best results, use in combination with Himalaya Anti-Hair Fall Oil, Himalaya Anti-Hair Fall Shampoo, and Anti-Hair Fall Hair Cream. Safe to use on artificially colored or permed hair.